Stocks flew too close to the sun. Now what? Stock market booms are fun -- until they end in tears. That's one of the lessons from the past few months. As the Dow shattered one record after another -- it shot from 25,000 to 26,000 in just seven days -- bullish sentiment became way too extreme. Nothing could knock the market off its relentless climb. Stocks got so hot that they were vulnerable to a shock -- which is just what happened this week. Fears about rapidly rising bond rates sent the Dow plunging 1,175 points on Monday, and then 1,033 points on Thursday. "The market had started to go vertical. That's a melt-up," said Mary Ann Bartels, head of portfolio strategy at Merrill Lynch. But there's a big difference between this time and the market storms of 2008: This time, the turmoil doesn't appear to be triggered by a disaster forming in the economy, the kind of event that could completely wash out the bull market. It may take a few weeks, but most market analysts believe the stock rally that began in 2009 can get back on track -- as long as the U.S. economy keeps growing and the Federal Reserve isn't forced to fight inflation with aggressive rate hikes. "We're clearly very late in this bull market and getting closer to bear market," said Dan Suzuki, senior investment strategist at Bank of America. "But sitting out the end of bull markets is extremely painful." Stocks became expensive during the boom as investors celebrated the Republican tax cuts and robust economic growth at home and abroad. The S&P 500's price-to-earnings ratio, a common way to evaluate stock prices, hit 18.3 at the end of January. That's lofty -- well above the 25-year average of about 16 -- and it left stocks priced for perfection. But then came the shock. It started with trouble in the normally quiet bond market. Heavy selling drove the yield on the 10-year Treasury note to a four-year high, fanning fears of inflation that would force the Federal Reserve to raise interest rates faster than planned. The S&P 500 had gone nearly 600 days without a 5% pullback from previous highs, but it finally got there -- almost all in one day. The S&P 500 plunged 4% on Monday alone. The VIX (VIX) volatility index spiked by 116%, its largest surge ever. Stock market volatility "is back with a vengeance," Pierre Blanchet, head of multi asset strategy at HSBC, wrote in a report this week. But that doesn't mean the economy is in trouble. The Atlanta Federal Reserve's forecast calls for economic growth at a 4% pace in the first quarter. That's not exactly setting off recession alarm bells. If anything, investors are worried that the economy could overheat. Corporate profits remain strong, and global growth is on the upswing. "Everything is signaling that the economy is strong, earnings are growing and that this is the correction that everyone has been waiting for," Bartels said. Analysts have long been calling for a "correction" -- a 10% decline from previous highs -- to wash out exuberant market sentiment and give investors waiting on the sidelines a chance to enter. 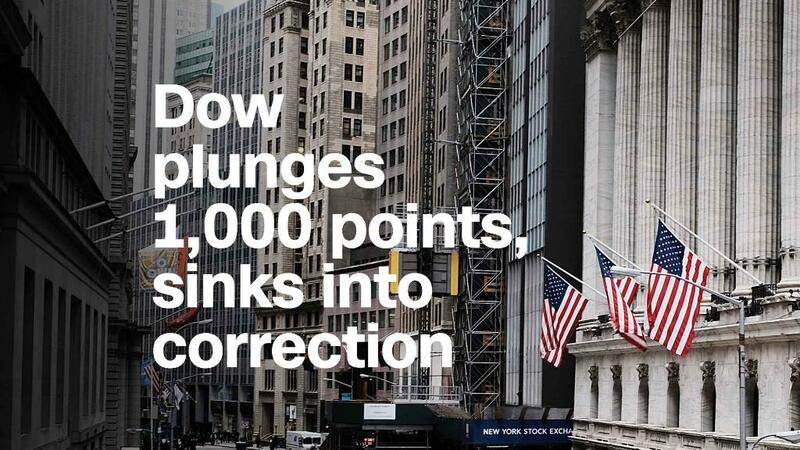 The correction came on Thursday, the first for the Dow and S&P 500 in two years. Of course, now that the market has finally taken a breather, the intensity of the selling is freaking everyone out. "Everyone was wondering when we would get the 10% correction -- we just didn't expect it in 72 hours," said JJ Kinahan chief market strategist at TD Ameritrade. It's too early to say whether the worst is over. Investors hoped that the lows on Monday would be the bottom, but then the S&P 500 dipped below that level on Thursday. Candice Bangsund, portfolio manager at Fiera Capital, believes more "exuberance in the marketplace needs to be flushed out" before the sell-off is over. "We think the market is likely to be vulnerable in the coming week or so," she said. "We're treading carefully before jumping in." Even if the worst of the selling is in the rearview mirror, the ride may be bumpy for awhile. This type of volatility can take weeks to work through the system. Turbulence is especially likely if bond yields creep back up. Thursday's slide occurred after the 10-year touched a four-year high of 2.88%. Analysts said a rapid move above 3% will spook the market. "Higher volatility is here to stay. It's not going to be the straight line we saw prior to the sell-off," said Suzuki.